You must be a member of the Kuala Lumpur DinnerNations Group to attend this activity. Would you like to join this group? Come indulge with me for an evening of casual dining over satisfying food, good company and in a relaxing ambience. 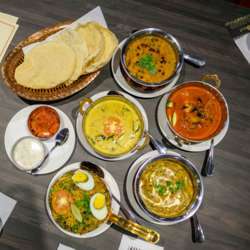 Protected content is an intriguing new locale for fans of Indian fare that opened last year; helmed partly by Malaysian family members of Keralan ancestry, the restaurant shines a spotlight on specialities from the southwestern Indian coastal state. Traditional seafood recipes like the lightly tangy, mango-infused Alleppey Fish Curry and the Prawn Moilee, rich in coconut milk, might be the ideal introduction to this destination. Besides, Protected content also has an interesting section of an in house-bar called Whiskeypedia serving a selection of liquor and wine. The Falooda is a fun dessert, bringing together ice cream with jelly, sweet basil seeds, vermicelli, nuts and more for a satisfactory end to the Protected content experience. Pay for what you eat for Food, Drinks and Dessert. Alcohol will be charged separately. So Food for Thought, and All you Got, Right from the Pot! Looking forward to seeing you all. Thank you. Only click if you are CONFIRMED attending.